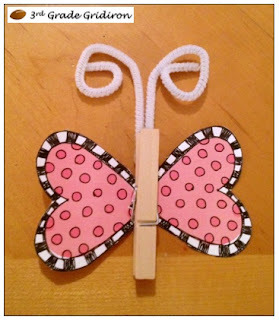 Looking for a creative and inexpensive craft for Valentine's Day? 1. Print the heart pattern (wings) in color on white card stock or on colored card stock. 2. Hot glue the pipe cleaner antennae at the top/backside of the clothespin. 3. Cut out the hearts and glue the ends together with regular glue. Then hot glue them to the back of the clothespin. 4. Draw the eyes on the clothespin with a dark-colored Sharpie. 5. Give it to that special someone! 1. You could clip a special note or goodie bag to the clothespin.